Coverage: Live on BBC Two and online from 27-30 October (19:00 BST), BBC One on 31 October (13:30) and BBC Two on 1 November (13:30). Great Britain secured a place in the women's gymnastics team competition at next summer's Rio Olympics with a superb performance in Glasgow. Amy Tinkler, Ruby Harrold, Ellie Downie, Becky Downie, Claudia Fragapane and Kelly Simm produced GB's best ever World Championships qualifying result. They finished third - behind the US and Russia but ahead of China - with eight places in Rio up for grabs. "We are incredibly proud," Becky Downie said of their achievement. "Coming in to this championships all our focus was on producing the best team results we could and to have placed third - our best ever Olympic qualifying performance - is very special. "Competing in Glasgow with the amazing support of the home crowd definitely gave us that extra energy and every member of the team contributed to our success. "It's taken a lot of hard work and dedication and that's definitely all paid of. We're all so happy to know we've got the Olympic places and we can head to Tuesday's team final full of confidence." 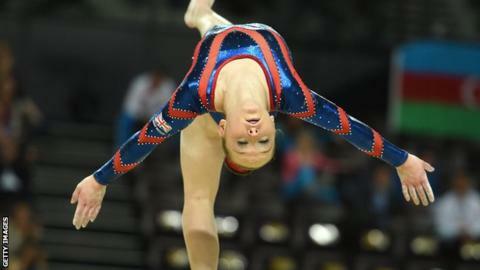 As well as claiming the team final place, several GB gymnasts have booked places in individual finals. Tinkler, 15, will go in Thursday's all-around final on her senior World Championships debut along with Harrold, who will also take part in uneven bars. Ellie Downie will challenge on vault and floor, where she will be joined by Fragapane.